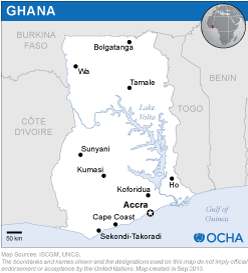 In recent decades, Ghana has been experiencing disasters triggered by hydro-meteorological hazards that have impacted urban and rural communities. In order to increase the country’s capacity to make use of to address these hazards, UN-SPIDER and the National Disaster Management Organization of Ghana (NADMO) held four-day training for representatives of government agencies and universities as a way to launch a technical inter-institutional team. The training took place in the facilities of the National Emergency Operations Centre of NADMO in Accra, Ghana. Members of government agencies and universities of Ghana. During the four-day training, Members of government agencies and universities of Ghana were trained on how to use two UN-SPIDER Recommended Practices on floods and droughts as a way to generate relevant and timely geospatial information that is useful for disaster risk reduction, preparedness and emergency response efforts. The training segment on the UN-SPIDER Recommended Practices focusing on floods was geared to build in-house capacities in Ghana to make use of radar satellite imagery to map the extent of floods. The recent floods that took place in Northern Ghana in August and September were used as an example during the training course. The UN-SPIDER Recommended Practice on droughts was presented as a way to contribute to drought monitoring efforts using drought indicators targeting the status of vegetation as a way to complement data generated by meteorological departments on rainfall and weather. The training course was used to start the establishment of a technical inter-institutional team that would focus its efforts on the generation of geospatial information extracted from space and in situ data as a way to contribute to disaster risk reduction, preparedness and emergency response efforts related to different types of events.